No One Is Too Small To Make A Big Difference! If people like Mandela, Gandhi, Helen Keller, Fred Hollows and a legion of others had said this and just let things stay as they were our world today would be even worse than it is now and the suffering and injustice they overcame would still plague us. “I am only one but still I am one. Now more than ever we ALL need to stand side by side, as one people sharing one world to save and protect each others right to peace, happiness, freedom and a safe healthy environment in which to live. find a way to make a change for the better. 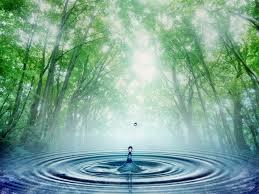 A might body of water is made from countless small drops joining together. If an injustice is knocking on your heart’s door and making itself known to you don’t ignore it. You CAN help make a change today for brighter tomorrow.